The raison d��tre of any concept car is to explore new ideas and to test those ideas in an attempt to create the ultimate solution. Know-how and passion, combined with imagination then become the motive force that turns dreams into reality. 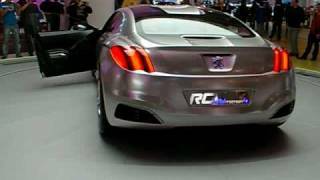 The Peugeot 908 RC evokes passion and imagination to allow us to dream but it will also have a serious side. The 908 RC owes its name to its engine: the Peugeot V12 HDi DPFS, which will power the racing version of the 908 in 2007. 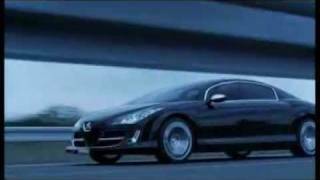 The abbreviation "RC", used to designate sports models in the Peugeot range in mainland Europe, also refers to the RC and RC concept cars which made their appearance in 2002 and whose architecture served as an inspiration during the design of this innovative project. The original idea was to create a limousine with an imposing style that offered its four occupants a new driving sensation. The final design, however, is an uncompromising car that combines dynamic performance, comfort, luxury and environmental protection. In short, it is an exclusive four-door vehicle that will capture the imagination of both occupants and onlookers. The 908 RC is powered by Peugeot�s V12 HDi DPFS (diesel particulate filter system) diesel engine designed to take part in the "Le Mans Race Series" programme in 2007. The engine has a capacity of 5.5-litres and offers a level of performance unprecedented for a diesel engine, with a maximum power output greater than 700bhp and, above all, an exceptional torque in excess of 1200Nm. With a 100� V angle architecture, the engine�s centre of gravity is as low as possible. Two particulate filters are located at the end of each exhaust system ensuring the car�s environmentally-friendly credentials. The originality of the 908 RC resides in its compact design, with the engine arranged in a rear central transverse position. Similarly the compact 6-speed electronically controlled sequential gearbox has been specially adapted to withstand the phenomenal torque, and is located under the engine. The design of the 908 RC creates a particularly low-lying exterior body with a stylish tapered design at the front of the vehicle. Its proportions create an elegant and dynamic statement. 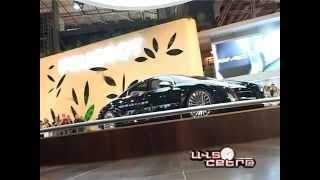 Sitting on large diameter 20 spoke alloy wheels (20�� at the front, 21�� at the rear); the overall effect is that of a big cat, from the nose at the front, to the tip of the rear lights. More than ever, the Marque�s emblem has played a part in fashioning the power of expression of the 908 RC. At the front, the lion�s character seems to emanate from each detail, starting with the design of the headlights. Lighting is provided by light-emitting diodes (LEDs), with their dazzling appearance the result of a special finish given to the internal components. The exterior appearance of the lights looks like a crystal, cut like a precious stone, creating a faint outline like the pupil of an eye. The bonnet draws its inspiration directly from the head of a big cat. The areas either side of the bonnet create the effect of the cat�s "cheeks" with the bonnet tapering down to a nose, highlighted by the large chromed emblem of the Marque. Aligned with the curves of the car�s pronounced "hindquarters", the rear lights, equipped with LEDs, incorporate a polished aluminium insert evoking the shape of a powerful claw. The dynamic rear profile is characterised by the shape of the rear air diffuser, accentuated by chrome detailing and supported visually on each side by twin exhaust pipes. The ambience inside the 908 RC is the result of meticulous attention to detail on the part of the car�s designers. Thanks to a forward-positioned passenger compartment made possible by the car�s architecture, and a large glazed surface area of 3m2, occupants are truly at one with the road and the passing landscape. The special shape of the huge front windscreen allows a completely unimpeded field of vision (as on the RC concept cars). The front windscreen stretches back behind the driver�s head, as far as the B/C post where the glazed roof begins. This gives both front and rear passengers a sense of being at one with the outside environment. Unequalled brightness and visibility combine with a generous interior space, complete with four independent seats, helping to create a truly exceptional ambience. The high-quality materials and interior finish of the 908 RC create an atmosphere that is both luxurious and timeless. The passenger compartment features dark oak surrounds, integral amethyst-grey leather trim, polished aluminium inserts, touches of chrome, and a Bell&Ross clock: everything stimulates the senses of touch, sight and smell. Practical aspects have not been overlooked either. Numerous storage spaces, in addition to the large air conditioned glove box, are located in the door panels and also in the front and rear consoles. The car�s aerodynamics have been particularly fine-tuned to attain an excellent drag coefficient of only 0.556. The air ducts were designed in a wind tunnel to optimise the car�s performance and fuel consumption, while ensuring the necessary cooling of the power train. A two-part front air intake directs air to cool both of the engine�s radiators and also improve the car�s aerodynamic performance by controlling the internal and external flow by means of the black anodised aluminium vents located upstream of the front wheels. Touch screen LCD XGA 10.4"